Printmaking, the process of creating artworks through printing, consists of many different techniques. In printmaking, the process and experience are often as important as the final artwork. As we were planning to introduce a printmaking workshop as one of the holiday workshops, the first thing to consider was which techniques to include in the workshop. Which of the printmaking methods are simple for kids to understand and execute, and practical to conduct in our studio? After considering the feasibility and complexity of the different printmaking techniques, monotype and linocut were eventually selected. Monotype is a relatively quick and easy method of printmaking, and produces only a single print. On the other hand, the process of making a linocut is more time-consuming and complex, but allows for the printing of multiples of a same piece. There are a variety of ways to create a monotype, and 2 methods were selected: trace monotype and wipe out monotype. Trace monotype is a simple technique to introduce printmaking, as it involved making a print by tracing. Essentially, the paper is laid on top of an inked surface (acrylic sheet). The design is drawn or traced on the back of the paper, and through this pressure, ink from the surface is transferred to the paper, creating a singular print. This simple technique served as an introduction as to how prints are usually made: through the transfer of ink, from a surface to paper. For wipe out monotype, a surface is inked fully, before removing areas of ink to create a subtractive image, which is then transferred onto a sheet of paper to create a single print. Instead of painting in areas, you wipe away ink, using cottons buds or tissues, in areas where your design is white. Wipe out monotype also allows one to create a range of tones, depending on how much ink is wiped away and how much is left on the surface. This technique was also a bridge to link monotype printing with the subsequent technique, linocut. 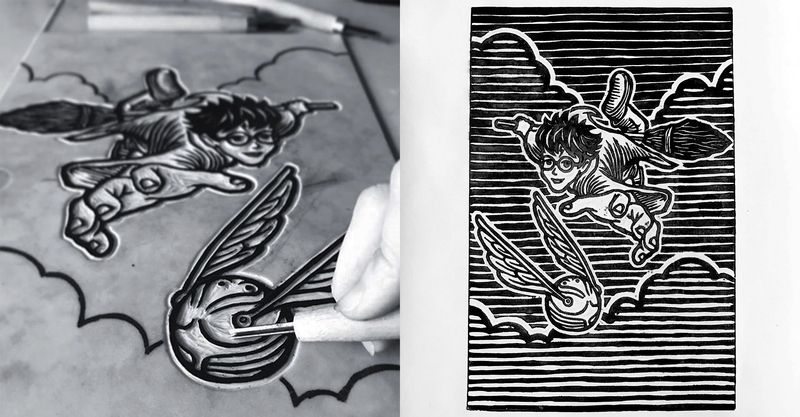 For linocut, the design is carved into the lino, to create a relief surface for printing. Like wipe out monotype, you are essentially removing areas where you do not want printed. As it involves carving away areas of lino, it is more complex and requires more time. It also requires planning and a visualisation of the final work, as carving the lino is irreversible. The outcome of a linocut print tends to yield a more graphic look. The lino can also be inked repeatedly and with different colours, to create multiple prints. Printmaking introduces many possibilities in art due to the wide variety of printmaking techniques. 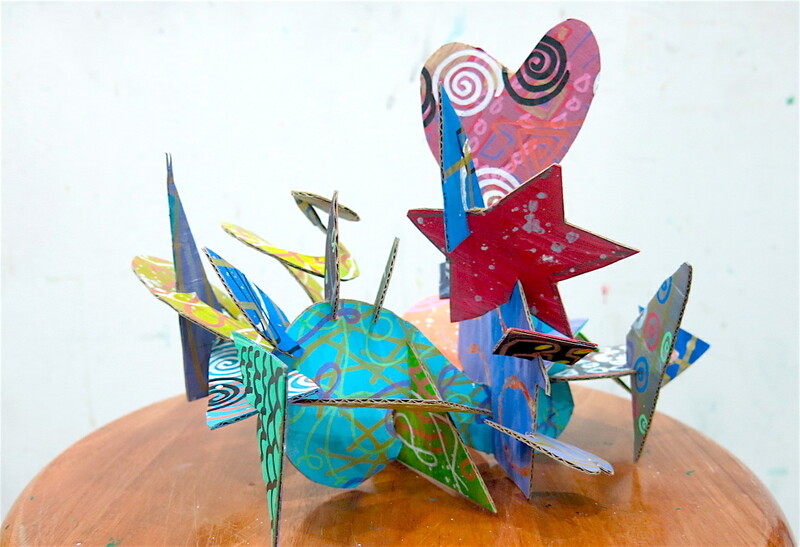 Printmaking methods can be combined with other mediums to create interesting artworks. For example, Yolanda Frederikse is an artist who creates beautiful watercolour monotypes. Instead of using printing inks, she uses watercolour to paint onto a plate to create her prints. The prints have a distinct look from watercolour paintings due to the printmaking process. A single artwork can also consist of a few different techniques, creating a hybrid print. With the digital age, more artists are incorporating the use of digital technology with traditional printmaking methods in their art making process. Artist Alison Lumb has an archive of textures, sourced from monoprints, photography and watercolour sketches, which she utilizes in her printmaking collage works. For example, in her Street Scenes series, she incorporates photography and monoprinting to create a hybrid print. The figures in Street Scene I were created with monotype techniques, combined digitally and collaged with a monoprint texture from her texture library to produce the final print. Through the printmaking workshop, we hope that our students will gain a greater interest in and appreciation for printmaking, and go on to explore more possibilities that printmaking has to offer.